More than three years into their fight to unionize, Legal Aid Ontario lawyers are stepping up the pressure on the provincial government. A group of LAO lawyers rallied outside a Liberal Party of Ontario fundraiser that Premier Kathleen Wynne attended in downtown Toronto on July 13, along with representatives of labour groups. The lawyers have been fighting a decision by LAO to reject their request to unionize since 2013. “Almost all other groups of public sector lawyers exercise their right to collective bargaining. Other groups like the assistant Crown attorneys, who are largely white and male-dominated, have that right already and that difference is not lost on us,” Legal Aid Ontario staff lawyer Dana Fisher said at the rally. Fisher says collective bargaining would help her colleagues secure working conditions that would help better serve their clients. Fisher works in a small office with 14 others. There are no desks for individual lawyers and no private space to meet with clients. The office is not accessible for people with mobility issues, she says. In 2015, the lawyers filed a Charter application challenging what they say is the refusal of LAO to bargain with their chosen representative — the Society of Energy Professionals. The Ontario Superior Court will hear the challenge on Dec. 5. 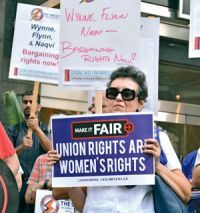 “I shouldn’t have to be going to court on their behalf to try to compel Legal Aid Ontario to respect these lawyers’ Charter rights to collectively bargain,” says lawyer Steven Barrett, of Goldblatt Partners LLP, who is representing the group. Lawyers are excluded under the Labour Relations Act, meaning they would need voluntary recognition from LAO in order to unionize. Section 1(3)(b) of the act says that anyone who is a member of the legal profession is not deemed an employee under the legislation. “They’re antiquated exclusions. They make no sense any more. There is a constitutional right to bargain and it should be respected,” Barrett says of the Labour Relations Act exclusion. Barrett says LAO has stonewalled the lawyers and refused to even meet with them. Graeme Burk, a spokesman for Legal Aid Ontario, said LAO remains interested in meeting with the group of lawyers to discuss their concerns. Brendan Crawley, a spokesman for the Ministry of the Attorney General, said the ministry is aware of the matter. “Legal Aid Ontario is an independent organization whose management and board of directors are responsible for operations and human resources matters,” he said in an e-mail. Three LAO lawyers have also filed a pay equity gap complaint to Ontario’s Pay Equity Commission on the basis that legal aid lawyers are predominantly female. Their complaint says LAO must conduct a job evaluation review that would look at whether its lawyers’ pay is in line with that of the lawyers’ male counterparts.The Pay Equity Act defines a position as a “female job class” when 60 per cent or more of the people in that position are female, says Barrett, who is also representing the lawyers on the pay equity action. “Given that the class is now confirmed to be predominately female, [LAO] has to do a gender-neutral job evaluation . . . to make sure that the predominantly female lawyers working as duty counsel at LAO are not being underpaid relative to their male comparators,” Barrett says. Barrett says a similar complaint was previously rejected on the basis that the complainants did not have sufficient evidence to suggest that the staff lawyer position at LAO can be deemed “a female job class” for the purpose of the Pay Equity Act. “If the staff were unionized, they’d be entitled to disclose that information, but because LAO has refused to recognize the Society [of Energy Professionals] as their bargaining agent, they weren’t able to get the information they needed,” Barrett says. But the information they needed has since come from an interesting place, the complainants say. When the LAO lawyers launched their Charter challenge in regards to their bargaining rights, former legal aid CEO Bob Ward submitted a sworn affidavit in which he “bragged” that by the end of 2015, two-thirds of LAO lawyers were women, says Barrett. “They’ve now conceded whatever the pay equity process had earlier determined there wasn’t sufficient evidence [to support],” he adds. “In 2015, the Pay Equity Commission confirmed that the staff lawyer job class is a gender-neutral job class, and found that there was no contravention of the Pay Equity Act,” Neil said in an e-mail. LAO staff lawyer Linh Le, who is one of the three complainants, says pay equity legislation is “meaningless” if it’s not enforceable.